David Raygoza is a bigfoot researcher who lives in Fresno, CA. Through casual conversations, he discovered a location not too far from his home where bigfoots had been seen over the years. After repeatedly visiting the location, he started befriending the locals in a nearby town. These locals further verified that there were indeed sasquatches living in the hills just outside of town, and the good folks were willing to share more specific information with David about the sasquatches' habits. Over his years of research in this small area, David has reportedly found many footprints, had game cameras messed with, has had branches thrown at him, and has had possibly two brief sightings of the creatures. 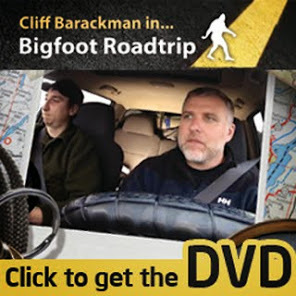 He has also shown me two blobby videos that he claims are sasquatches. They might be, but it is impossible to tell from the videos themselves. I have spent several nights in the area, but have never had an encounter there. It is a nasty, brushy area full of ticks, poison oak, and scorpions. Water is plentiful in the colder months, but the creeks dry to a trickle in the hotter summer months. There is a history of bigfoot activity from not too far away. There are few photographs of footprints that David has found from this area, in spite of my constant prodding to document his finds. The few pictures I have seen do not do the tracks justice. However, the accompanying photo is an excellent one, clearly showing toes and having an interesting shape to the instep of the foot. It was this photograph that convinced me that David had possibly found a good spot to conduct his research. The same photo, cropped and enhanced. Please note the two possible bear prints in the lower half of the photograph. It is possible that a bear is responsible for the possible bigfoot impression as well. Unfortunately this footprint was not cast, so further conclusions on this impression are necessarily bound within the realm of speculation. .
More information on this footprint may be found on my online database of casts and impressions. Dr. Jeff Meldrum has weighed in on this footprint via email. He notes that the three clearest toe impressions appear to be the triplet of a bear track. He goes on to suggest that the hinder part of the track could be another fore paw angled towards the bottom left. Dr. Meldrum's comments say volumes to the idea of obtaining data to share with the community. All amateur bigfoot researchers should always document their finds and make them publicly available for scrutiny. Only through a collaborative effort with the sasquatch become a recognized species. Very interesting report, Cliff. Sometimes ya gotta eliminate all the possibilities to reach a working hypothesis. Great investigative work. See ya Friday, bud. Take care. Cliff, the track appears to consist of a cow track and a bear track. There are free range cattle in the area. Without a larger picture to examine, the back of the track appears to be a cow track in mud.